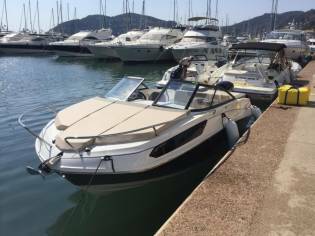 2017 Bayliner VR5 Bowrider fitted with the Mercruiser 4.5L 200HP MPI/Alpha 1 engine and drive. We bought this boat new in February 2017 and it has done less than 100 hours. It is in immaculate condition throughout and comes with a twin axle SBS Roller Coaster R4 2000 EL trailer fitted with the SBS flushing system & unused spare wheel & tyre. Fresh water use only! 'Smart' tabs fitted for improved planing and fuel efficiency. These boats now cost in excess of £40,000, excluding a trailer (approximately £3,500)! 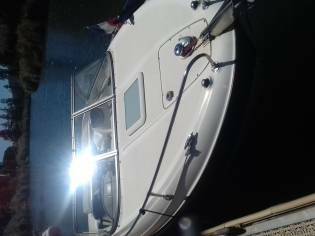 This boat and trailer combination is a bargain at just £35,495! The hull is finished in black & white with a red stripe with Desert Sand upholstery. The cockpit flooring is Rush effect. Bimini top. Bow filler cushion. Cockpit table. Six drinks holders. Bow seating. Helm bucket seat with bolster, which swivels 180°. Cavernous ski locker. Lockable glove box. Waterproof 120-watt AM/FM stereo/controller with inputs for iPod & Mp3. Rear sun lounger. Cockpit sun lounger which can be adapted for either forward or rear facing viewing. Fire extinguisher. Helm: 12v power outlet, horn, padded & tilting steering wheel, power steering. Engine Compartment: Blower, bilge pump and automatic fire extinguisher. Instrumentation: Speedometer, volt meter, fuel gauge, tachometer, trim gauge, side mounted engine controls with trim & tilt switch in the handle. Compass. Hull and deck: Navigation lights, non-slip floor, integral transom platform with ladder, mooring cleats, safety handholds, stainless steel towing ring, vinyl gunwale moulding, wraparound windscreen with safety glass. 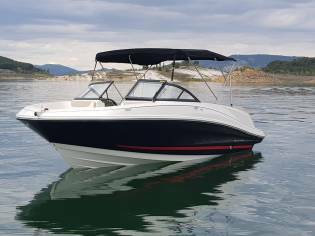 Manufacturer provided description: The VR5 builds on Bayliner’s proven V-bottom runabout heritage, while adding form AND function. Forward, the boat employs Bayliner’s category-leading BeamForward design, which carries the full 8 feet of beam further forward in the boat than has been traditionally done. The self-bailing cockpit features Bayliner’s new AftAdvantage™ design that increases the aft seating area by extending it to the aft most point of the running surface, then adding the swim platform at the end of the running surface. This keeps the platform apart from the usable interior space, rather than encroaching on it. The result is a boat that maximises space and value like never before. Key Features: • BeamForward™ design with high gunnels creates more passenger space, under-seat storage and safety. • Exceptionally roomy cockpit thanks to our exclusive AftAdvantage™ design • Standard integrated swim platform and optional platform extension are positioned further aft than comparable models adding interior space while providing the ideal staging area for water sports. • Available Water Sports or Fishing Options let you customise the VR5 to suit your family's needs. Advertised elsewhere. 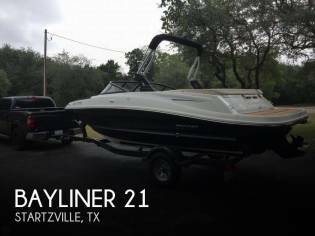 2017 Bayliner VR5 Bowrider tailored with the Mercruiser 4.5L 200HP MPI/Alpha 1 engine and navigate. These vessels now cost in excess of £40,000, excluding a trailer (approximately £3,500)! This vessel and trailer combination is a bargain at just £35,495! The body is finished in black & white with a red stripe with Desert Sand cushioning. The cockpit platforming is Rush effect. Bimini top. Bow filler cushion. Cockpit desk. Six drinks holders. Bow accommodation. Helm bucket chair with bolster, which swivels 180°. Cavernous ski safe. Lockable glove box. Waterproof 120-watt AM/FM stereo/controller with inputs for iPod & Mp3. Rear sun lounger. Cockpit sun lounger which can be adapted for either forward or stern facing viewing. Fire extinguisher. Blower, bilge pump and automated fire extinguisher. Speedometer, volt meter, gasoline gauge, tachometer, cut gauge, side mounted engine controls with cut & tilt switch in the handle. Compass. Navigation illumination, non-slip platform, integral transom platform with ladder, mooring cleats, safety handholds, stainless steel towing ring, vinyl gunwale moulding, wraparound windscreen with safety glass. The VR5 builds on Bayliner’s proven V-bottom runabout heritage, while adding form AND function. Forward, the vessel employs Bayliner’s category-leading BeamForward design, which carries the full 8 feet of light further forward in the vessel than has been traditionally done. The self-bailing cockpit special Bayliner’s fresh AftAdvantage™ design that increases the aft accommodation area by extending it to the aft most point of the running surface, then adding the swim platform at the end of the running surface. This keeps the platform separate from the usable inside space, rather than encroaching on it. The result is a vessel that maximises space and value like never before. Key Features: • BeamForward™ design with high gunnels creates more passenger space, under-chair stowage and safety. • Exceptionally spacious cockpit thanks to our exclusive AftAdvantage™ design • Standard integrated swim platform and optional platform extension are positioned further aft than comparable models adding inside space while providing the ideal staging area for water sports. • Available Water Sports or Fishing Options let you customise the VR5 to suit your family's needs. 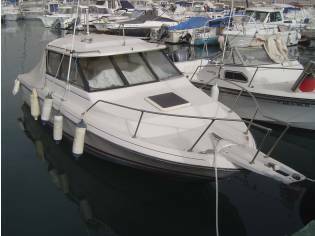 The Company deals the details of this boat as provided exclusively by the proprietor and cannot assurance or warrant the accuracy of this information nor warrant the quality of the boat. A buyer should instruct his agents, or his surveyors, to investigate such details as the buyer desires validated. 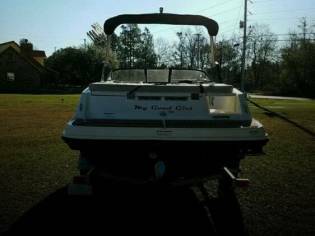 This boat is offered subject to prior sale, price change, or withdrawal without notice. 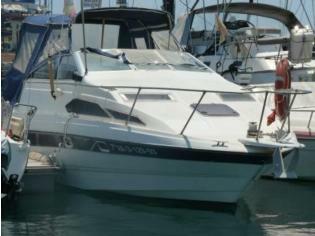 All communication in regards to this boat will be passed on by the Company direct to the proprietor. 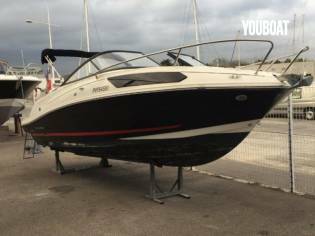 You can buy this Bayliner VR5, open boat of the 2017 for 41.049€. This boat of 6,12m of length and 2.4m of beam can be found in Yorkshire (United Kingdom).